Conan Doyle remarried in 1907 to Jean Leckie and George Edalji was one of his guests at the wedding reception. He said later on that ‘there was no guest he was prouder to see’. Conan Doyle had known Jean from many years before going back to 1897, but fell in love with her as soon as he met her. He had a secret relationship with Jean for nearly ten tears. He took great care to make sure Louise never knew, as she enough to cope with due to her health problems. Air Arthur, having a sound moral outlook on life, described the relationship with Jean as purely platonic until their marriage. When they first met back in 1897, they both fell in Love immediately. It really was a case of love at first sight. Following their marriage they moved to Crowborough in Sussex. It was at his beautiful house Windlesham that he spent the rest of his life at, but he also kept a small flat in London. After his marriage he tried his hand at some play writing. He wrote three plays that were unsuccessful. But undeterred he wrote a fourth one with Sherlock Holmes as the main character, called ‘The Stonor case’ later renamed as ‘The speckled band’. It was a roaring success after receiving rave reviews. Conan Doyle took up a campaign against Belgian oppression in the Congo by writing ‘The crime of the Congo’ in 1909. The birth of his son Denis that year prevented him from writing much fiction. He was kept from writing again when Adrian was born in 1910. However, you couldn’t keep Sir Arthur quiet for long as he was to become involved in another high profile miscarriage of Justice case. The suspect this time was called Oscar Slater, a man that Sir Arthur once described as “not a desirable member of society”. Slater had a dubious background in illegal gambling, and was well known to the police. The case concerned the murder of a woman called Miss Marion Gilchrist who lived in Glasgow. It started in 1908 when Miss Gilchrist was bludgeoned to death in her apartment while her servant Helen Lambie went out on an errand. When Lambie returned, she found her mistress lying on the floor covered in blood with her papers scattered, and noticed a diamond brooch missing. A man was seen leaving the crime scene who was later identified as Oscar Slater. There was a massive public outcry over the murder, and pressure was applied to the police in bringing a suspect to trial. Slater seemed to fit the profile of the murder, so the police announced that they were looking for Oscar Slater in connection with the case. Slater in the meantime had recently pawned a diamond brooch and slipped off to America under an assumed name. Why would he do this? It was case closed as far as the police were concerned. Slater who heard about the warrant for his arrest came back from America with the intention of proving his innocence. It was found that the brooch pawned was different to Miss Gilchrist’s. The police said that they found a small hammer in Slater’s house that they believed was the murder weapon. He went to court in 1909. Unfortunately Slater was found Guilty and was sentenced to death. After a plea for clemency from his lawyers the sentence was commuted to life imprisonment. Slater’s lawyers contacted Sir Arthur to see if he could help Slater prove his innocence; in which they wholeheartedly believed. Conan Doyle got to work on the facts of the case. Although he didn’t approve of Slater’s background or character, he felt that he was innocent of the Gilchrist murder. He outlined the evidence for this, point by point, in a book The Case of Oscar Slater proving his innocence. The facts found by Conan Doyle were overwhelming. Slater used an assumed name on travelling to America because he was hiding the relationship from his wife, not the police as was earlier assumed. The murder weapon was supposedly a hammer found in Slater’s possession, although a medical examiner believed that a wooden chair leg cover in blood was the actual weapon used. Sir Arthur concluded that Miss Gilchrist knew the murderer, as she opened the door and allowed the killer in. Although they lived near each other, Slater and Gilchrist had never met one another. Demand for a retrial faltered. The authorities said there was not enough evidence to reopen the case. But it was not until 1914 when new evidence came to light that a witness could prove that he was not present at the scene of the crime when the murder took place. However, the killer blow was that Gilchrist’s servant, Helen Lambie, although she had identified Slater in the trial as the man seen in the hallway, at the time she gave the police another name, which the police decided not investigate. Officials still refused to reopen the case. Sir Arthur was outraged and said “The whole case will, in my opinion, remain immortal in the classics of crime as the supreme example of official incompetence and obstinacy." The momentum for a retrial was lost for nearly a decade although Conan Doyle did his very best; there was nobody willing to carry the torch any further. Slater contacted Doyle in 1925 with a secret letter smuggled out by another convict on waterproof paper, held no less under his tongue. He pleaded with Sir Arthur not to forget him. Sir Arthur always an honourable man fired off some letters and lobbied any friends and MPs willing to listen. This may have resulted in a book being published in 1927 by a Glasgow journalist, William Park, called The Truth about Oscar Slater in which he expounded on Conan Doyle’s theory that Miss Gilchrist knew her murderer. He added that the killer was probably her nephew but could not name him in the book due to the libel laws. It generated lots of newspaper columns and there was uproar when police witnesses came forward to say that they were coaxed into identifying Slater as the man they saw at the building where the murder took place. The pressure finally paid off, although a bit late after eighteen and a half years, when the secretary of state for Scotland ordered the release of Slater in November 1927. Doyle set about trying to gain a pardon for Slater and a retrial was ordered. With the help of generous donations from Sir Arthur and his friends his legal costs were met. Slater was cleared of all charges and received £6000 in compensation, a considerable sum in those days. 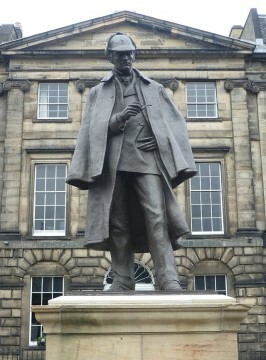 Conan Doyle assumed that Slater would repay those who helped pay his costs, but Slater took a different view saying that he should not have to pay his court costs anyway, so they soon fell out over this. Conan Doyle did not want, or need the money, but it was Slater’s ingratitude to those who stood by him that really upset him. Conan Doyle later wrote to him saying, "You seem to have taken leave of your senses. If you are indeed responsible for your actions, then you are the most ungrateful as well as the most foolish person whom I have ever known." Sir Arthur was not one to let things get him down. He always believed that what he did was for the right reason, even though the end didn’t justify the means.